What's with the hype? How much do MTs make? Show me the money!!! There's no hype about it, but there's definitely a great demand. Companies have been breathing down our necks for graduates. Entry level transcriptionists' salaries are competitive with other BPO (CSR/TSR) employees'; everyone starts at the bottom during the familiarization phase as with any field; typically Php 14-17K a month, including incentives. Once they gain some experience, they quickly get promoted to editors or QAs, and they earn substantially HIGHER, typically Php 30-50K. Some of our new graduates actually bypass the MT stage and get hired as editors or QAs! Other companies pay by the line. A typical MT transcribing 1,000 lines a day can make over Php 30K a month, or Php 40K if assigned to a graveyard shift. Home-based transcriptionists with direct accounts earn by the line or per hour. One of our former students is currently earning $12/hour, home-based. Given our current exchange rate, that's over Php 100K a month; not a small sum in the Philippines. What's the difference between Allied-medical and Regular course (also called Non-allied course)? Allied-medical means that you are a doctor, nurse, PT, or have at least taken a medical course, like Biology or Chemistry. Even if you only finished a year of schooling, we have a medical competency exam to see if you're qualified. Regular means you have absolutely no medical knowledge. For the Regular (Non-allied) course, 340 hours or roughly 4 months. Too long? Call us for other arrangements. For the Allied-medical course, 200 hours or as short as 5 weeks. What's next? What about OJT or Legal Transcription? We have an in-house OJT program which is 160 hours. Optionally, you can take it with another company. If you're up to it, you can be a Legal Transcriptionist for an additional 80 hours only, which is roughly two weeks! Why should I train there? There are lots of other schools. We're not just a school. We have an actual Transcription company. We teach you what we've been doing in the industry for over a DECADE now. We train you not just to become excellent students, but excellent job-ready transcriptionists! If you are good and we have openings, we'll hire you, as we've hired MANY of our own students in the past. Okay, but I heard that Company X offers FREE training. Shouldn't I take that offer instead of enrolling at OTSI? Free is FREE right? Can't beat that price. Few things in this world are truly free anymore. Chances are, they'll teach you to do a specific account with very specific tools — their exclusive tools — for their job. The goal wouldn't be to educate you, but to profit from your production. After a few weeks, you'll probably be cut from the roster. Without sound fundamentals, whatever knowledge you gained will be basically useless, and you'll eventually have to retrain all over again if you wish to remain competitive and move to other companies. OTSI will teach you the basics so you can get it right the first time around. You get the whole package. We'll teach you everything you need to know from the ground up. We'll teach you fundamentals that you can use in ANY account, ANY company, ANYWHERE in the world! You'll even have the basic building-blocks of being a Legal or General Transcriptionist. And since we are TESDA-registered, your certificate(s) will be recognized internationally. A few years back, we were surprised to hear from a professional MT who wanted to enroll with us. She didn't have any formal training, and who only knew how to transcribe gastrointestinal files from a specific physician. She lacked the fundamentals and couldn't move to other accounts. After finishing her training and OJT with us, not only did she become a well-rounded MT, she was promoted! We've also had professional MTs come all the way from the Middle East, since their employers now required them to be registered MTs with certificates. The OTSI training they gained, plus the TESDA-registered certificate, did wonders. Even if you don't have plans of going abroad, it doesn't hurt to have an MT certificate and training under your belt. At OTSI, we'll train you to be a top-notch, well-grounded and well-rounded transcriptionist for the world — with NO strings attached. For the Regular (Non-allied) course, a choice between morning (8-12) or afternoon (1-5) classes. For the Allied course, you set your own time but it is highly recommended you come to class the whole day. But hey, I'm a very busy person, currently working/studying, but I want to take up Medical Transcription. What if I don't fit in any of your schedules? If you have any medical background, we can work around your schedule. You can come to class in your spare time. A lot of our students are call-center agents or nurses who work the night shift. If you don't have any medical background, we'll assess you if you could take special classes to fit your schedule within reason. Do you have Saturday or online classes? We made an exception for allied students. For those without any medical background, we strongly discourage purely Saturday classes. Realistically, it would take you a year or so to finish, plus you'll neither be as good nor employable as someone who has taken it full-time. Quality will be severely compromised. 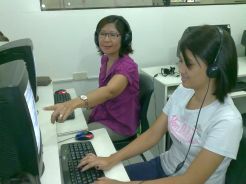 Also, we believe that the best way to learn transcription is by having live mentors by your side. They have actual experience in the industry and they can guide you every step of the way. You won't have to make silly mistakes on your first job. Transcription is a hands-on course, like driving or cooking. Skill can only be acquired by constant practice. This is why we discourage online classes. Also, do bear in mind that you'll be competing against graduates who actually trained in a center. I am too young and just a high school graduate, or already too old and retired! Are there any age-limits? Absolutely none! We've had students as young as 16, and as old as 72. As long as you are eager to work, why not? We once hired a 69-year-old student of ours. Aside from having our own Transcription company, we are a member of HIMOAP. Promising students can and WILL be referred to Transcription companies. Literally hundreds of jobs await you! Okay, I'm convinced. So how much is the tuition fee? Our rates for either Allied or Non-allied are quite affordable — less than what you can earn in your first two months of a transcription job. Please call or visit us. What's this medical coding/billing I've been hearing about? They're all part of what we call the "medical circle of care". The transcriptionists take down doctors' notes and laboratory data — to be further processed by editors and QAs. Medical coders then assign ICD-9 codes from those medical records, which become the bases for Medical billers' invoices and insurance claims. We have sponsored our MT graduates to train for free. It is BEST that you have medical transcription experience or some medical background first to qualify you for medical coding and billing.